We sometimes get so caught up on where the music is coming from (New York, Chicago, Oslo, London, Sydney, Paris, Stockholm, Tokyo, Sao Paulo, Lisbon, etc.) that we forget what ITS all about. ITS about the MUSIC! Not about where IT comes from. 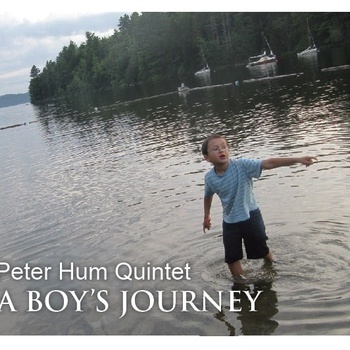 So when I got a copy of Peter Hum's A Boys Journey, I was surprised to learn that Peter was from Canada. I know Canada has a great jazz scene but I hadn't really been exposed to new artists from there in a long time. Ottawa native, Peter Hum is a wonderful and refreshing pianist with a stellar debut. Hum has a unique perspective on the jazz scene as he is also a journalist for the Ottawa Citizen newspaper. He brings a well-studied and articulate vision to the proceedings on his debut, A Boys Journey. It's a journey that is sometimes autobiographical (describing his father and as well as moments of his childhood) but more importantly its a album that holds your attention from beginning to end. Hum's career in jazz stretches over three decades both as writer, student, composer and musician. His style is subtle, elegant and joyful. For me its reminiscent of Cedar Walton, McCoy Tyner or more recent artists like David Hazeltine and Stephen Scott. Peter Hum put together a solid band of musicians he has known and played with in various forms over the years. They provide an atmosphere that is both calming and exciting throughout A Boys Journey. The ability to play off each other makes these ten tracks feel like they had been performing them for decades instead of just a few days in the studio. "Take The High Road" opens on a soulful and impassioned note with some strong displays from Hum and his horn section. It's an infectious number because of its lyric beauty and lush arrangement. Hum's compositions allow the band to stretch out individually, as on "Big Lou", with it's slow but deep groove laid out Walkington in its opening chords and then aided buy Hum masterfully on electric piano. Nathan Cepelinski shines here with some excellent scale work and shadows Hum note for note. As with the beginning, Walkington returns to level the field again as the group slide nicely into its closing bars. Peter Hum also shows his gentle side on the lovely ballads "Midway" and the title track which are intimate portraits balancing out the albums more uptempo moments. They also serve as highlights for the saxophonists who display complete command and depth of the compositions. "Unagi" adds a bite to the session with fierce solo work from Warren and Omae and Hancock-esque funk from Hum on electric piano. Hum seems comfortable as both the fusion and acoustic setting which also makes A Boys Journey a very dynamic record to experience. "Three Wishes" closes out the session and is almost a microcosm of A Boys Journey. It builds slowly with a delicate interaction between Hum and his horn section before the entire group joins in with some great rhythmic patterns and dense grooves. This gives way to a powerful solo from Walkington before the entire group returns on a gentle note to close out the piece. Well structured all around. A Boys Journey is a touching debut from an artist who sits on both sides of the musical fence. Peter Hum's watching, learning, performing pays off in an incredibly rich and rewarding manner through A Boys Journey. A Boys Journey is a real touch of class from north of the border that you should definitely check out.